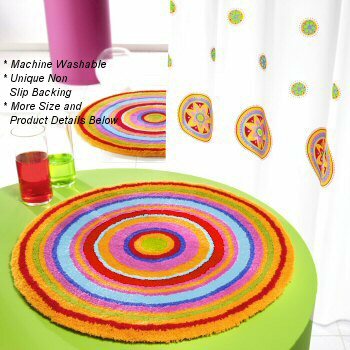 Stylish vibrant multi color round rugs available in saffron orange multi-color. Saffron: Saffron orange is the base color for this fun rug. Other colors include key lime green, light blue, red, warm pink and dark blue rings. Coordinated lid cover is solid saffron orange. Taupe: What a great way to have a round rug with a fun design and a timeless color scheme. The color range includes taupe : greyish brown, light taupe, light and dark steel grey and snow white. Coordinated lid cover: is solid taupe. Turquoise: Keeping up with the bathroom color trends is easy with this round bath rug. The color range blue turquoise, light blue, bright yellow green, moss green and snow white. Coordinated lid cover: is solid turquoise blue. Mandala elongated lid covers are a solid color and coordinate with the base color of each rug swatch.